The last drop of a subscriber communications network - from the node or tap to the home (also known as the "drop network") - has traditionally been designed apart from the rest of the network. At this point, the signal - and the medium that carries it - has very different conditions and requirements than the other parts of the network; it is where the network leaves the sky or ground and enters into our homes. This part of the network can be hard to change or to work with because of its existing connections and its very immediate impact on our customers' experiences. Making plans and decisions about the drop network involves different criteria and considerations than the rest of the network. What is happening in the "drop"? The drop network is more and more burdened every year. The wide acceptance of HD content by consumers demands much higher and better quality capacity per user. OTT cloud based services require interactive and high quality capacity. All these raise the bar for the technology for connecting to the homes/rooms of customers. And this is before the widespread adoption of the Internet of Things (IoT) devices, such as sensors, security cameras, and other products that will all use the same broadband connection. In addition, soon full duplex DOCSIS 3.1 could deliver symmetrical speeds of 10 Gbit/s over a coax connection. 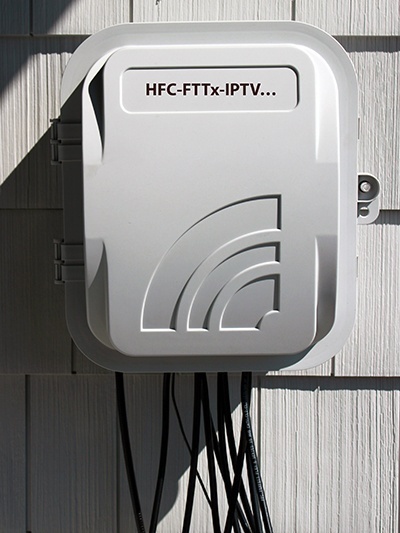 To keep up with demand, fiber to the home (FTTH) can be a slow and expensive implementation when solid coaxial cable already connects many homes. FTTH is most economical in high density, high service uptake areas, but may require digging costly trenches to lay fiber cables, or negotiating through challenging conduit systems. However, single mode fiber has been consistently backwards compatible for some time now. In capacity and scale, fiber as a medium for carrying data is still very far ahead of the equipment available to FTTH bidders (or demand from subscribers). Installing something like G657A2 will still have enormous future potential. On the other hand, each segment of a coaxial network currently can achieve over 1 Gbps HD quality bandwidth without disturbing the existing digital TV services and cable modem offerings. Yet, the increasing need for bandwidth and speed seems infinite. What is the best drop network design for the future? Given the high rate of change, your drop network must be agile and adapt if you are to thrive and survive as a provider of services. Agility can be defined as the ability of a system to adapt to change. Assuming each new Technology, Service, Format, or Content (TSFC) requires a certain amount of bandwidth, speed, and performance, the highest profitability will partially be achieved by minimizing the cost to achieve the performance of the TSFC. Here we will focus on cost. How do you minimize the cost of introducing and operating a new TSFC? Determine the least amount of change required to implement. It is a common sense axiom that the more revenue you can attain with the least amount of change to your existing business, the higher the profit will be. In some cases, you may even be able to reduce the costs of existing business by introducing a new TSFC. Another consideration is that by eliminating the time and resources necessary to plan for capacity and densities before they are needed, project timelines can be shortened. How will we know which method to choose? How much OPEX and CAPEX should I plan for? How long will we be able to continue to use coax? With the vast amount of infrastructure operators already maintain, in the short term it's better to use existing assets more efficiently than to make big technology investments. If you are fairly certain that the capital expenditure is going to be buying useful equipment - something more mechanical than technological that’s going to be here for the next 10 to 20 years - then it makes sense to buy. However, the pace of change and adoption of new technology in relation to media consumption implies that OPEX may be preferable to CAPEX in your network. The decision between short term vs. long term benefits will be unique for each network. So what does an agile drop network look like and how can I create one? The speed of deployment is simply how fast the TSFC can be planned, designed, installed, tested, and put into operation. Operators need new TSFCs in months, not years. If you can scale with existing resources, large upfront investment can be avoided in favor of other projects with greater return potential. Can you build/install only what current customers need, and reconfigure as needed for different densities, different levels of redundancy different speeds, and different interfaces without reconfiguring the entire network?